ATS's Short-Single M4 Magazine Pouch is designed to securely hold a single thirty round M4 style magazine, including the Magpul PMAG30. The pouch features an open top design with an adjustable bungee retention cord and pull tab to secure the mag. 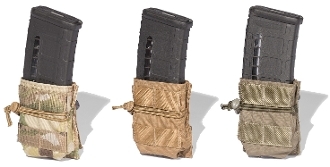 The Short-Single M4 Magazine Pouch has additional 1" webbing on the front of the pouch allowing you to layer MOLLE compatible pouches like the ATS Single Pistol Mag pouch, on its face. This pouch is constructed from 500 denier abrasion and water-resistant Cordura nylon and it attaches to any MOLLE/PALS modular webbing. M4 magazines pictured is not included. Like everything ATS makes, this pouch is made in the USA. It's covered by a lifetime warranty against defects in materials or workmanship.